We Nepalese seem to go ballistic whenever a report tells us that Gautama Buddha was born in India. We protest before the Indian embassy, we ban movies or books alleged to have committed such a folly, we shout with chauvinism that he was born in Nepal! Perhaps this suits our shallow politicians' modus operandi of bringing out yet more fissures in the society. But should not rational minds look at the history books? Gautama Buddha was born a prince in the Sakya kingdom of Kapilavastu in 543 B.C. Obviously there was neither an Indian Union then nor the state of Nepal. The Sub-continent known as India to the Greeks (referring to the Indus Valley civilization) or Hindustan to the Persians or Bharat to the locals was a land mass located east of the Indus River and south of the Himalayan mountains. Its eastern borders stretched to the Bay of Bengal and its southern borders to the tip of Kerala. There were many kingdoms of many nationalities dotting this vast territory. When Alexander the Great fought his way to the Indus River and crossed it to war with the Indian king Porus (Parvateshwar), his kingdom was limited in size to what is today's Pakistani Punjab. There were many Brahmin Kingdoms in the Indus Valley. The year was 326 B.C. nearly one hundred and fifty years after Buddha passed away circa 486 B.C. but nobody refers to a religion called Buddhism in the Greek chronicles. The first Indian Empire to be formed encompassing the northern territories with its capital in Pataliputra or modern-day Patna the capital of Bihar State, stretching from the Indus River to the Bay of Bengal and from the Himalayas to the Deccan plateau, was the Mauryan Empire of Chandragupta Maurya circa 320 B.C. Prior to this there were small Indian kingdoms and Greek satraps in western India while the Nanda Dynasty dominated in the Indo-Gangetic plains. It was only during his grandson Ashoka's reign (273 - 232 B.C.) that Buddhism gained prominence after the emperor adopted it as his state religion - a religion of peace and non-violence his heart sought after - as an antidote against the misery brought by his many wars culminating in the brutality of the battle of Kalinga. Empires rose and fell. Hindusim and Buddhism vied for the soul of the Indian nation states, sometimes in life choking strangulation, at other times in symbiotic embrace. Islam thundered into India on marauding horseback from Central Asia. Arabian traders too brought Islam in their dhows from the sea. Ultimately Buddhism was the main casualty as this religion was wiped out from its mother base after having spread all over Asia, from Sri Lanka in the South to Thailand in the east, from Japan in the far-east to many parts of Central Asia. By the time of the British Raj in India even the very birthplace of Lord Buddha was a matter of conjecture as there was no concrete evidence remaining to point to the exact location of the ancient Sakya kingdom. Other Buddhist historical sites like the famous university of Nalanda had fallen into ruins. Holy pilgrimage spots like Bodhgaya and Sarnath were lying neglected. Prithivi Narayan Shah the Great united many principalities in his quest for a greater Nepali nation state in the second half of the 18th century. His dreams were fulfilled after the fall of Kathmandu valley's Malla kingdoms in 1769. We do not know when the territories of Kapilvastu came into modern Nepal but presumably by the reign of his son or grandson, it was already a part of Nepal. It was at the same time that the British East India Company that had once petitioned the court of the Mughal Emperor Akbar the Great to be allowed to trade in India had started to gobble up one Hindu kingdom after another Muslim sultanate. By the time of the discovery of the Ashokan Pillar the Nepali state was bordering British India some few kilometers south of Lumbini. At the end of the 19th century when the German archaeologist Fuhrer working for the Archaeological Survey of India started digging up the ancient ruins around Tilaurakot in Nepal Terai, he realized that this site was the ancient Kapilavastu, the capital of the kingdom of the Sakyas. The ancient Chinese travelers Fa Xian and Huen Tsiang had meticulously mapped their pilgrimage in the 4th and 7th Century respectively. Fuhrer used these ancient books as his guiding light. Nearby in Lumbini lying buried was found an Ashokan Pillar marking the site of Gautama Buddha's birth. On the pillar was clearly chiselled in Brahmi script an edict proclaiming that Emperor Ashoka had been on a pilgrimage to the Buddha's birthplace in the 20th year of his reign (circa 253 B.C.) and had granted tax exemption to Lumbini as a religious site. Taking this irrefutable evidence further excavation work was started together with the Rana regime of Nepal. The younger brother of Prime Minister Bir Shumsher, Khadga Shumsher was said to have taken keen interest in preserving the site and making stupas and monasteries for the faithful. So was Gautama Buddha born in Nepal? Yes and no. Was Buddha born in India? Certainly not in the Indian Union as we know of today. As empires rise and fall, as borders change with time, we can only with certainty say that Buddha was born in the Lumbini Gardens near Kapilavastu in the Sakya Kingdom of the 6th Century B.C., which is located presently in the southern Terai region of Nepal. 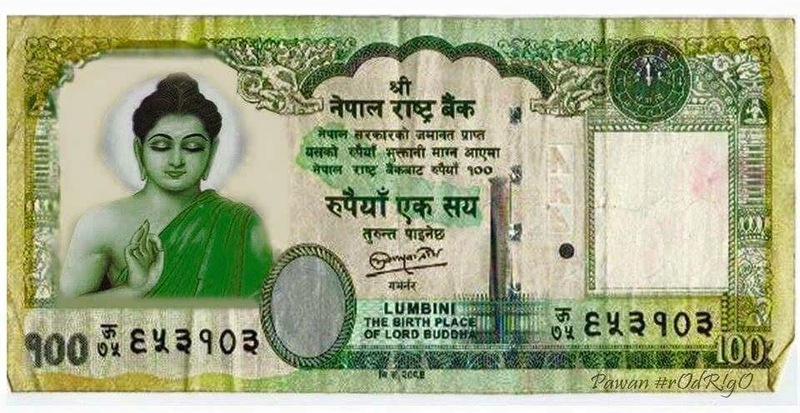 In another 5 year's time will history books write that Gautama Buddha was born in Madhes? Another marvelous meal of history. I guess it is perfectly correct then to say that Buddha was born in what is present-day Nepal. Indians claiming that he was born in India is a purely political maneuver to strengthen their support of the Dalai Lama and the Tibetan 'government in exile'. That maneuver must be countered, even if it means shouting about Greater Nepal, from Tista to Sutlej! What really matters is only the teachings of Gautam Buddha - the rest is window dressing. Thanks Subodh for the balanced article. It was a good read. As a kid I used to gape in wonderment at the magnificent crown my father possessed not knowing that the jewels were only for show. The dark green emerald drops were made of glass, the sparkling diamonds were probably zirconium and the pearls were not of the best sort. Every Rana general had his personal crown in those days and my father was no exception. I did not recognize the difference between this personal crown of father's and the other more valuable crown of the Nepalese Commander-in-Chief of the Army that my father was seen wearing in many a portrait displayed about the house. Little did I know that my father was the last person to put on his head the army chief's crown from the Rana era, real glittering diamonds, snow white pearls and thumb-sized emerald drops and all. The feather in the crown was the magnificent plumes of the Bird of Paradise that gave it such a majestic look. The first time I ever saw this historical edifice thirty five years ago, she was in ruins and looked like an old hag during the winter of her life, simply waiting for her eventual demise. I was then on my way further west on a week-long trek from Tansen to Tamghas in Gulmi District. Thirty five years later, I found myself at the same spot once again, this time out there on purpose. I had seen pictures of the building with a coat of new paint before and I wanted to see how much change had been made by the Nepal Government’s Department of Archeology. Yes, the outer façade still looked brand new with fresh paints, which to me personally was a bit too gaudy. But when I walked through the inside of the building and saw nothing but empty rooms without even a single piece of furniture, my enthusiasm took a nose dive. If only the Tudor King Henry VIII of England were as lucky as Jung Bahadur Rana, he would have had male heirs aplenty and he would not have had to behead a few of his queens in the hope of his next one presenting him with an heir. All the Maharanis would live together at Hampton Court Palace in seeming harmony at least until the death of the Maharajah. If England had the tradition of Sati, who among Henry's wives would have had the macabre honour of being buried alive with him? Would her be Catherine of Aragon his first queen? Or Anne Boleyn? Or the fair Jane Seymour, his favorite queen who gave him his only male heir, had she not died in her postnatal illness?